What makes a car classic? Is it simply a matter of age? 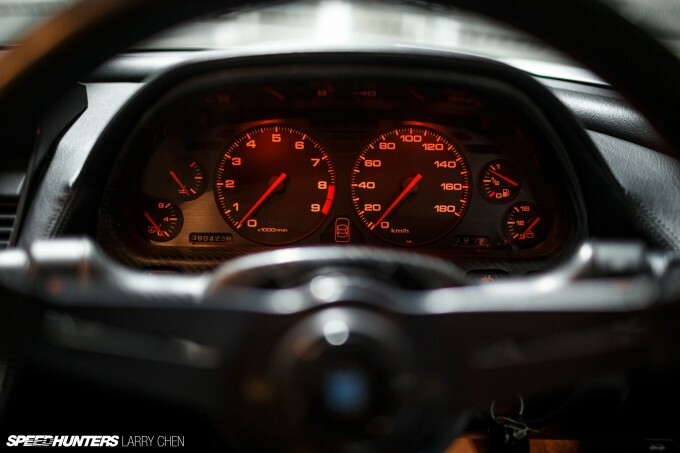 A matter of performance? Styling? Value? Those are all things that can be considered, but the more I’ve thought about it, the more I’ve come to the conclusion that a true classic is a car that cannot be replaced, replicated or made irrelevant. With the automotive industry moving at such a rapid pace these days, it’s easy to feel like cars have become just like computers. Not just in the way they operate, but in the way they are constantly being improved and refreshed, with each subsequent redesign having more technology, more safety, more horsepower, improved fuel economy and so on. If you go out and buy a brand new car today, there’s always the worry that it will soon be replaced by a better one. I think the upcoming reborn Acura NSX is a fine example of automakers pushing the limits when it comes to performance car engineering and technology. While we’ve yet to hop behind the wheel of the next-gen car, all accounts suggest it will be a pretty amazing machine with its twin turbochargers, three electric motors, 9-speed gearbox and all-wheel drive. But what will the arrival of the new NSX mean for the original version? Well, I don’t expect enthusiasm for the original cars to diminish one bit. In fact, I can only see more passion and appreciation for the first-gen car in coming years. Sure, the new NSX will likely beat out the original in every way. It will be way faster, safer, more comfortable, more fuel efficient and have a much higher level of technology throughout. But it certainly won’t replace the original. If anything, the arrival of the new NSX will only make us better realize how special its predecessor was. 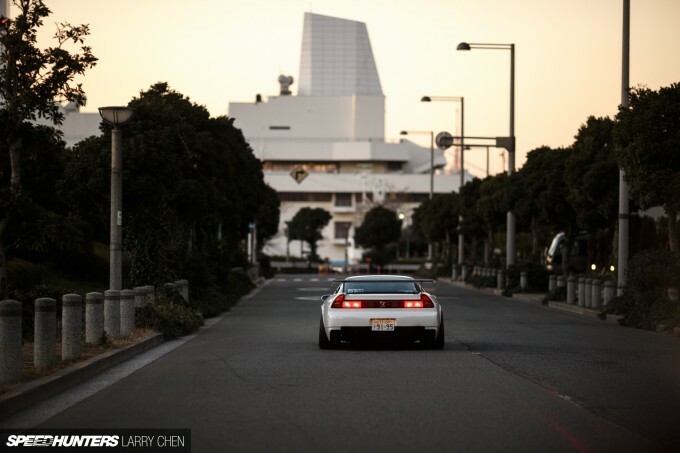 The NSX is one of those cars that never went out of style or felt obsolete. It was a rather advanced machine when it debuted, but by today’s standards it feels refreshingly simple and analog in nature. In terms of styling it was a head-turner when first introduced, and it still earns the same reactions on the street some 25 years on. 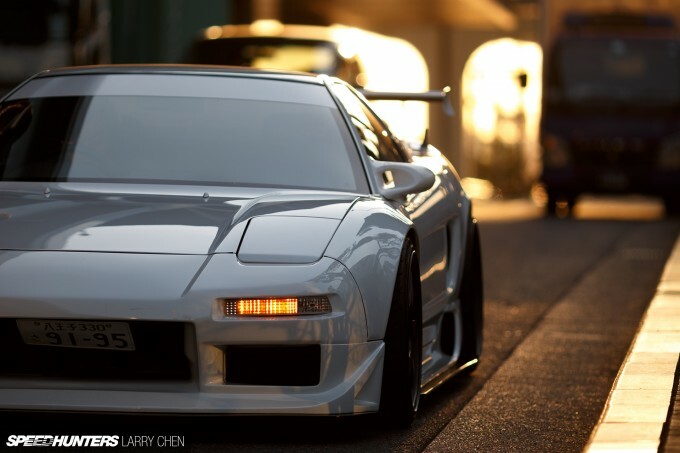 To many car enthusiasts, the first generation NSX represents Honda at its absolute peak. One of those enthusiasts is a Tokyo resident by the name of Yoshinobu. 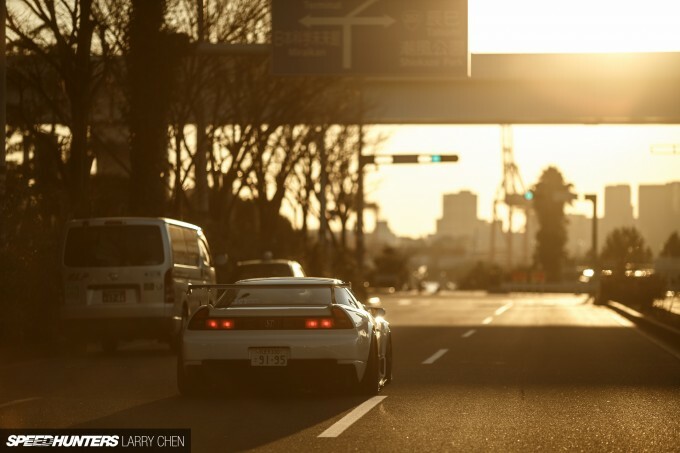 He has owned his NA1 NSX for about 13 years now, and during that time has massaged it into his ideal version of a street-going NSX. Yoshinobu’s first car was an FC3S Mazda RX-7, which he drove for five years before replacing with a more practical Honda Accord Wagon. His interest in cars did not subside though, and he soon found himself drawn towards vintage cars from the ’70s. He went on to own a couple of Toyota TE27 Corolla Levins, for which he’d collected quite an array of parts. All was going well until he was introduced to the Honda NSX by an acquaintance who owned one. Yoshinobu got a chance to experience the car, and he didn’t just like it – he completely fell in love with it. He soon decided he’d do whatever it would take to own one for himself. He sold all of his cars and the parts he’d gathered and set off on the hunt for of an NSX of his own. Grand Prix White was the color he wanted, and it would be two years before he came across a suitable car posted for sale on a dealer’s website. He promptly made plans to go and see the car for himself, and upon inspection everything checked out. 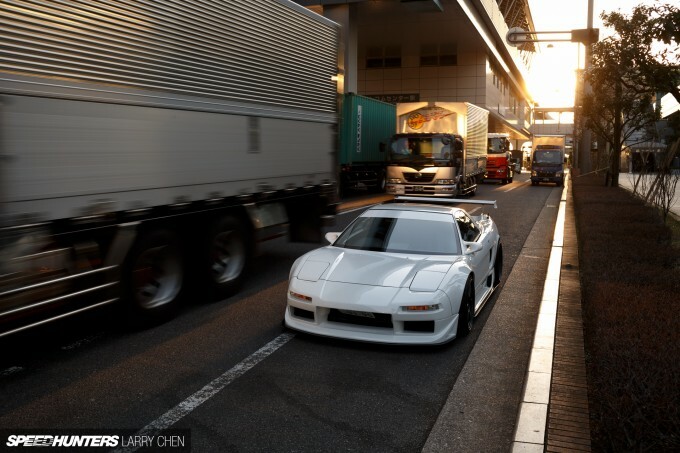 The paperwork was signed and Yoshinobu became an NSX owner. The car was 100 per cent stock when he acquired it, but Yoshinobu didn’t plan on keeping it that way. In fact, after spotting a photo of the PHASE NSX demo car in the Yokohama Tire & Wheel catalog, he was determined to modify his car with a similar style. 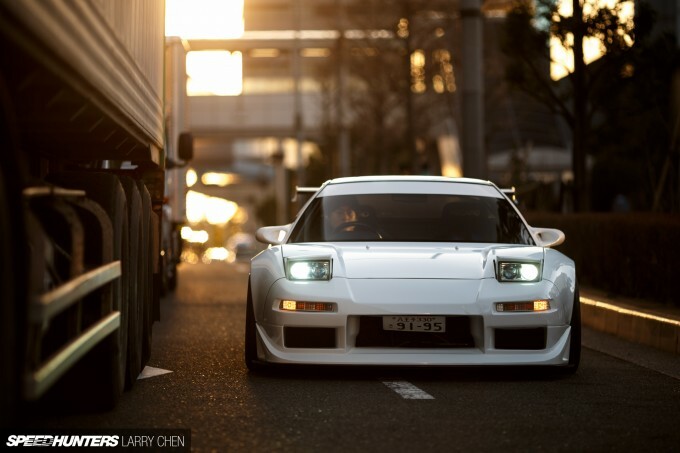 Little by little he transformed the stock NSX into the car you see here. For Yoshinobu, one of his biggest points of pride is the Honda’s bodywork and aero setup. Most of the body parts come from NSX specialists Marga Hills, but all of the panels have been customised in some way to give the car a cleaner, more seamless look. 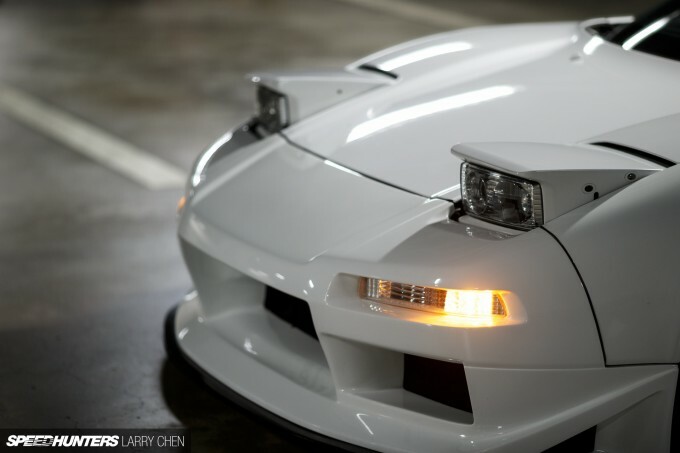 For example, he added OEM-style press lines to the front bumper, modified the wide body front fenders to better flow with NSX’s profile and did a custom duct in the rear diffuser – just to name a few of the many handcrafted touches. Yoshinobu also used custom under panels for both the front lip and side skirts, as well as carbon end pieces for the Marga Hills rear wing. As for power upgrades, rather than going for some sort of forced induction setup, the engine has stayed true to its naturally aspirated roots. 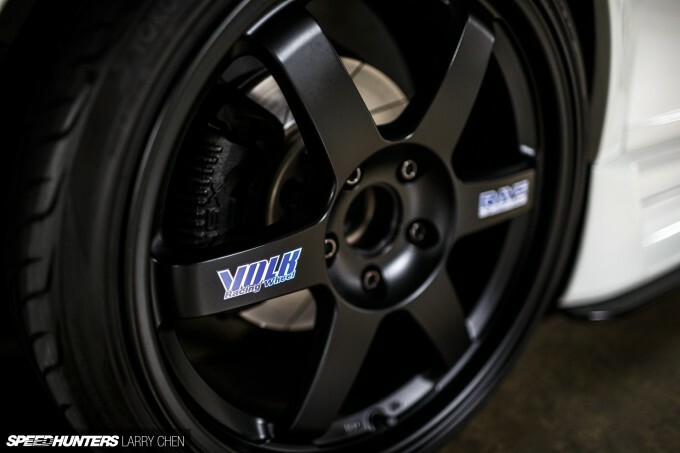 Upgrades include a Mishimoto carbon fiber induction system with TAITEC scoop and an ADVANCE GT titanium exhaust system. The drivetrain has also been upgraded with a KSP Engineering/OS Giken Super Lock differential, and an OS Giken clutch and flywheel combo. In the suspension and chassis department, the car is running a set of of PCR adjustable coilovers with BESTEX springs. Yoshinobu also fitted a stabilizer bar and a lower chassis reinforcement bar from an NSX-R, and Okuyama shock tower braces in both the front and rear. 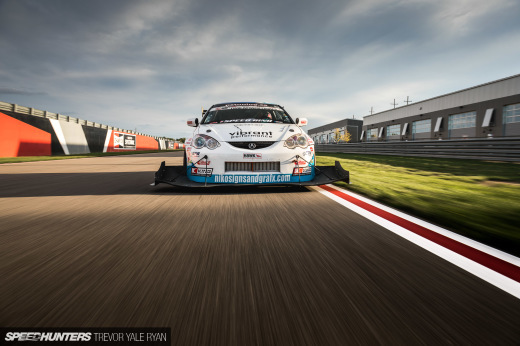 And what better wheel to match up with a legendary Japanese sportscar than the RAYS Volk Racing TE37? 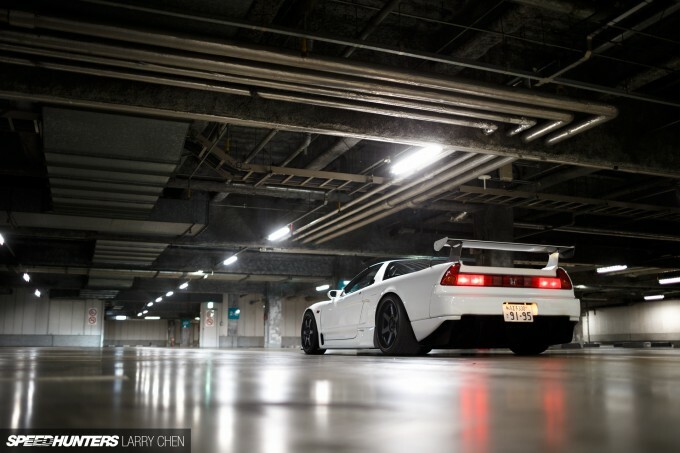 The NSX ran staggered wheel diameters from the factory, and Yoshinobu stayed true to that with 18-inch TE37s up front and 19s in the rear with Yokohama S.drive tires all around. 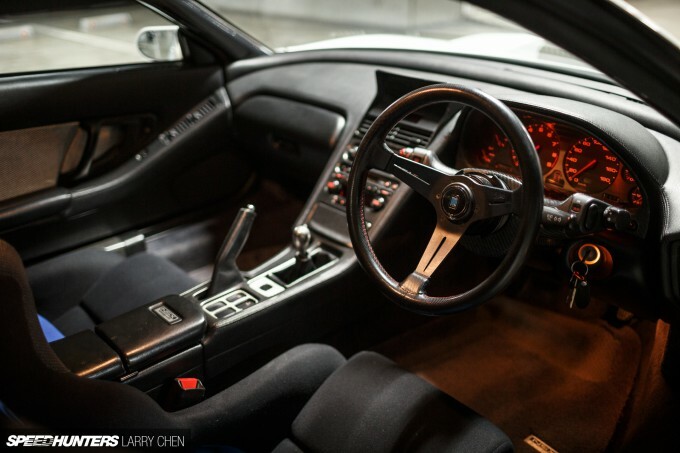 Inside the cockpit of the NSX, the modifications are tasteful and functional. 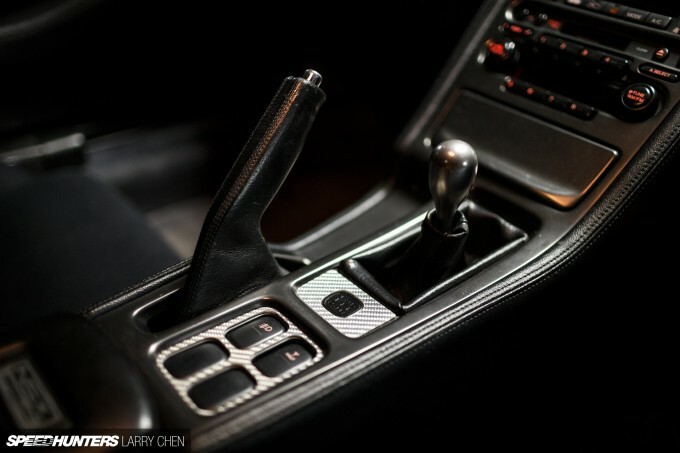 The shifter and knob come from an NSX-R and the steering wheel is a 350mm Nardi with a quick-release hub. 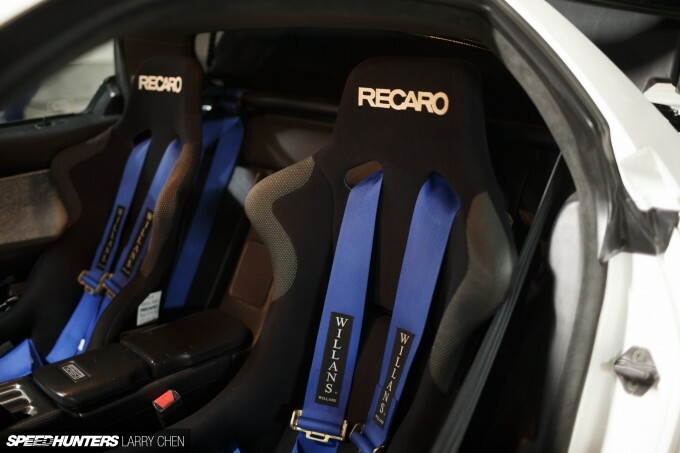 The seats for both the driver and passenger are Recaro SPGs on TAITEC mounts with Willans harnesses and a Ritomo harness bar. 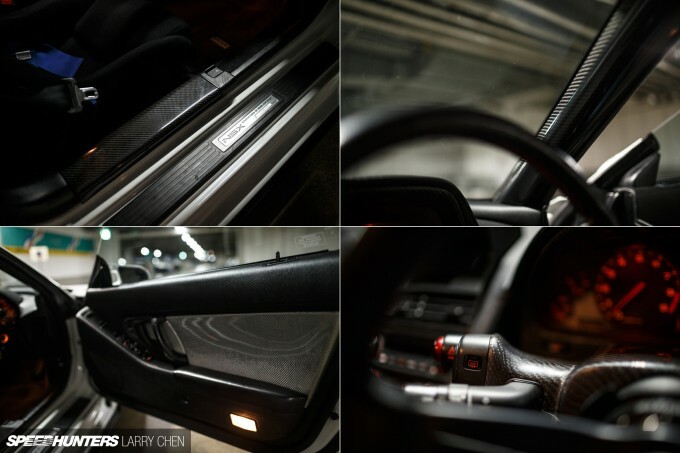 Another cool touch is the homemade carbon trim throughout the car, including the door pads, A-pillar covers, gauge covers, door sill garnish, and switch panel. 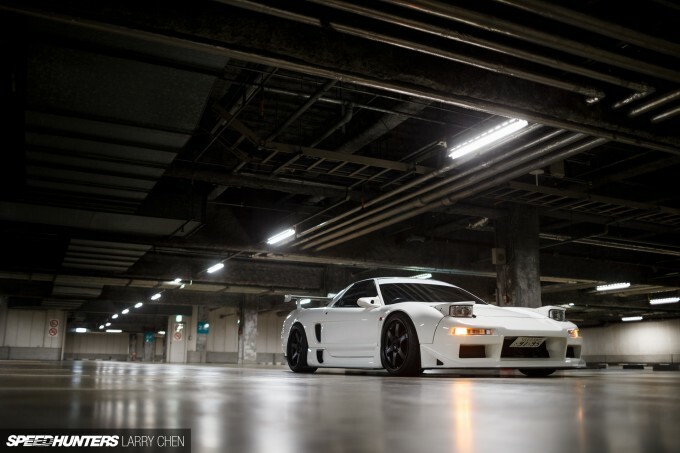 While it’s been a long journey for Yoshinobu and his NSX, he says he’s not yet done with the modifications on the car. 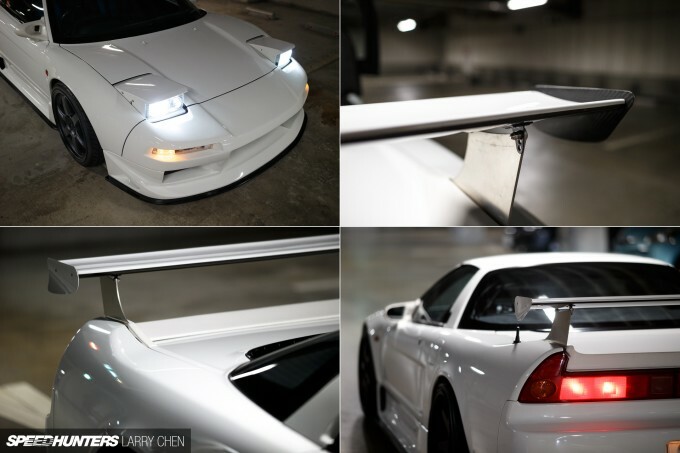 He actually has a complete ’02 NSX-R front end that he’s planning to fit, along with a StopTech Big Brake Kit. Aside from that, he wants to continue on with the handcrafted bodywork. Based on what we’ve seen so far, I have no doubt he’ll keep things tasteful and attractive. 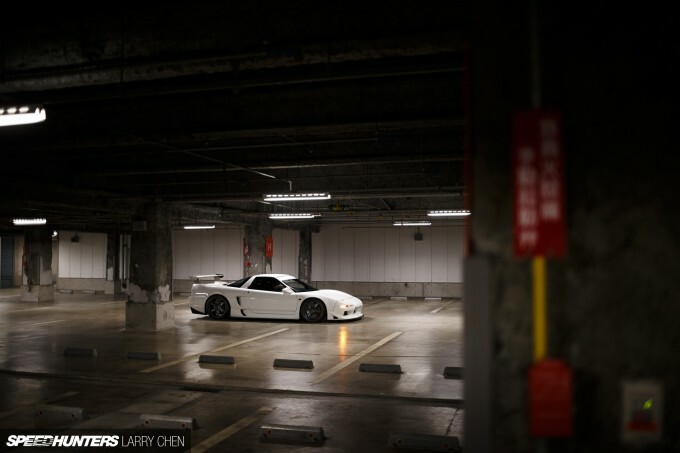 My feeling is that Yoshinobu has built an NSX with just as much appeal as the new tech-laden version that’s on the way. More importantly, it’s an appeal that will be as strong decades from now as it is today. 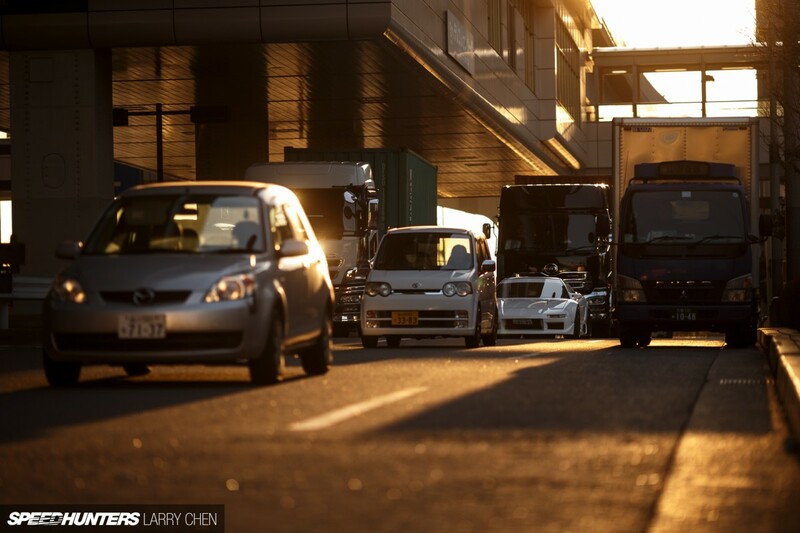 You could park a kei car in that front bumper shut line.. apart from that, amazing! Such a dope car (other than that front bumper/hood gap)! I like how the article started with what makes a classic. 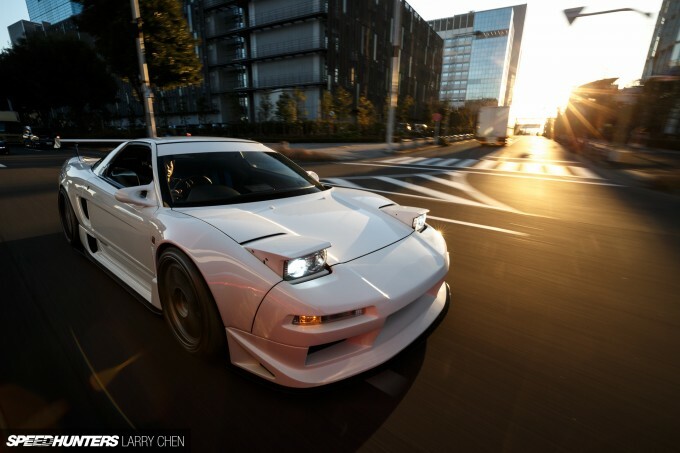 To be a classic like an NSX is the car must be a cohesive product, a renaissance car if you will. NSX, GTR, P1, hell the Miata all fit this role. I'll take a miata for its character over a 923847hp musclecar or a bentley any day of the week. 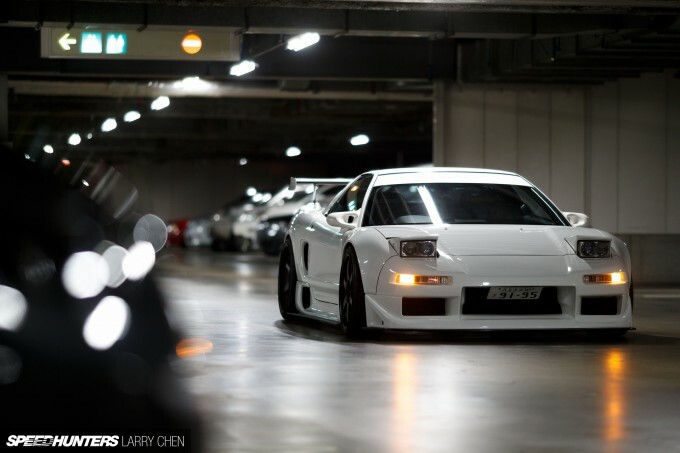 The NSX is the daddy though, it ages better than fine wine. I really wish a company would hearken back to the lean, angular aesthetic from the late 90s. I hope our cars aren't so boxy nowadays for "safety's" sake. I know that hindsight is 20-20, and that this car looked unusual when it debuted, but it really is a classic. The NSX stands in such contrast to current cars, and even its own modern incarnation, as a timeless, tasteful bundle of well-chosen lines and angles. One is given to wonder why modern cars have to be so stylistically gimmicky and topical, when it's possible to pen such a clean, classic shape. Ice Age It never looked unusual. 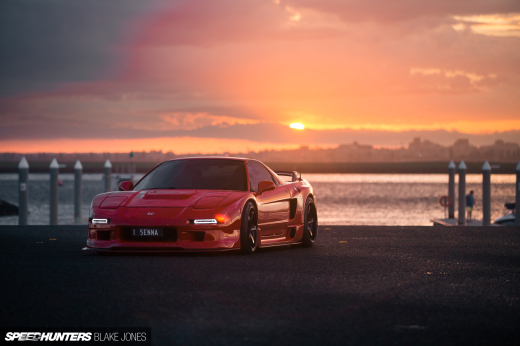 All the western car rags liked to say so but only because the NSX threatened their domestic and european fanboyisms. Smiggins Ice Age Wanna bet? I'm pretty sure that nothing else on the road at the time used an F-16 fighter plane for inspiration. bolt on fenders, stay away from this classic!!! aw lawd - I love to tease my friends with Honda's, as some do just because, we don't really mean it but this thing is just WOW I love it!! yes yes and more yes. A classic is a car that is somehow timeless, it stays fresh through time, as you say it cannot be replaced. I like to look at new cars and wonder which one will be a classic and which one will be forgotten. Where's that like button at ? I'd bet a majority of the people that see this car on the road think it's a new car, esp with the body kit. The definition of timeless. Ice Age Smiggins Im not sure what that has to do with anything. 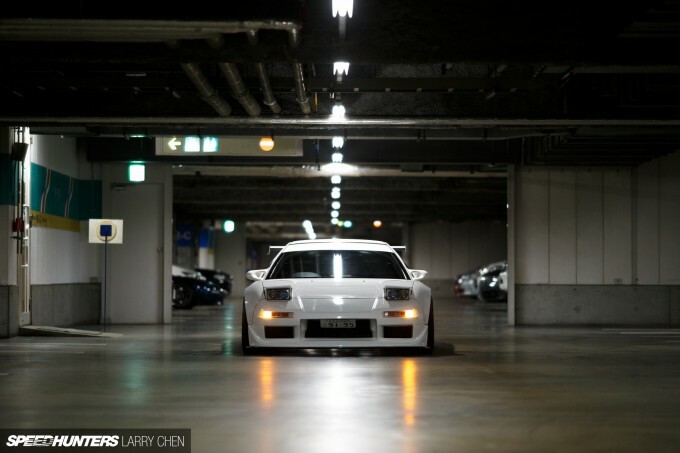 Maybe a stock body NSX would be nice to use for this article. I went from stock to widebody and then stock again. The stock shape is definitely timeless. As I had said before, I love NSXs. And being a fan of white cars, well, this is perfection in every bit. I am falling in love as well! Cars need to go back to this,technology has gone too far imo.Sure it is convinient some times but I can't help thinking that it took away the 'feel' and personality.It's like a futuristic movie where humans co-exist with soulless robots. timeless shape with senna's signature..! what else? However, please, pretty please tell him to replace his harnesses with ones from Takata. raidensnakeezio http://www.willans.com/history Both are great brands with excellent racing pedigree. 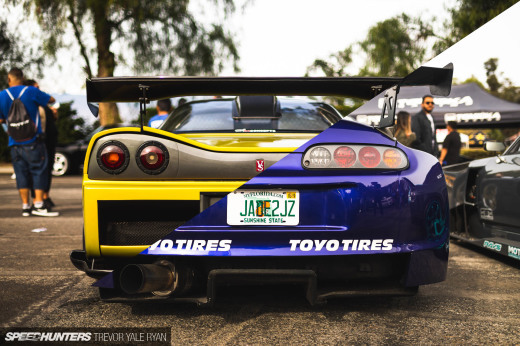 I don't think there's much need to change them out unless you don't like that they aren't JDM. Lawd ha' mercy, this car is too good. Excellent feature. Nice one Larry. Keeps me coming back here!